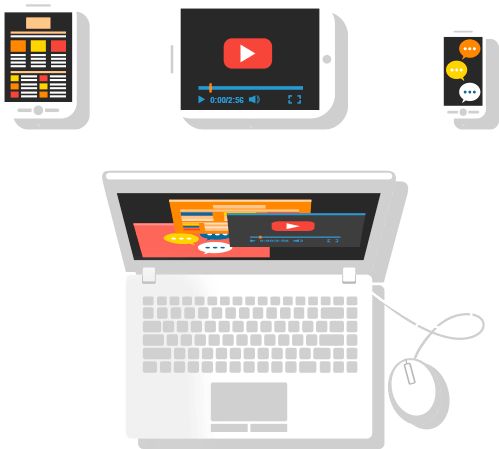 We deliver web application development to boost your digital presence and invite your users to where they’ll love staying – all with the latest and most effective tech. When Mitrix’s web engineers get down to programming, they never leave anything out but create engaging apps that also scale and integrate easily. We’ll craft an unbeatable look-and-feel that rests on a thought-out UX to earn you a dedicated audience. We power up your app with a robust server-side business logic, matching strong features to flawless performance. Have a project idea? We’re here to discuss it. In every project we do, we’re excited to see businesses empowered with our industry-specific solutions. It’s only possible when you recognize unique market drivers and requirements, and that’s exactly what we do. Together with brands and tech startups, we are shaping the digital retail of tomorrow through ecommerce innovation and deep consumer awareness. We fall on web based application development to bring people together wherever they are – at home, workplace, public spaces, you name it. We help not only to deliver content to your readers and viewers via powerful portals but to monetize it through subscriptions, sell-side platform integrations and more. From e-payments to online trading to digital banking, we bring in our multi-sided competencies to join forces with those who are disrupting financial services today. Bringing knowledge through technologies is our true passion. For this, we capitalize on expertise in e-learning, content management and communication solutions. IoT web application development is at the heart of what we do here, empowering our clients with smart diagnostics, maintenance and customer experience systems. Serving the entire healthcare delivery chain, we help to enable the true value-based care and connect patients to providers in a whole new way. To have a vendor like us behind your custom web application development project is to have hassle-free cooperation. As consultants, we’ll advise on everything from the methodology to the stack so that you can pick only reasonable options that pay off. We kick off with understanding your needs and expectations. For this, we gather detailed project requirements and verify them to ensure we look in the same direction. We build graphic mockups and validate them with you so that our UX/UI designers can go on giving your app an outstanding identity in line with user journeys. This is where the collected requirements and design come together in a fully functional web application, expertly coded by our developers. We run the app through rigorous full-scale testing at each development stage to ensure no bug or vulnerability creeps into the final product and avoid costly reworks. A good app is a well-maintained app, so we will be releasing new versions and adding extra niceties after the launch to keep your users satisfied. Have an idea? Contact Us!